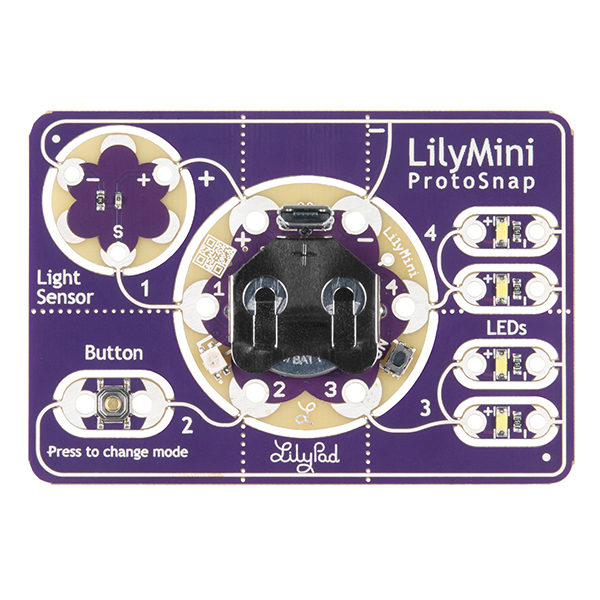 The LilyMini ProtoSnap is a great way to get started learning about creating interactive e-textile circuits before you start sewing. 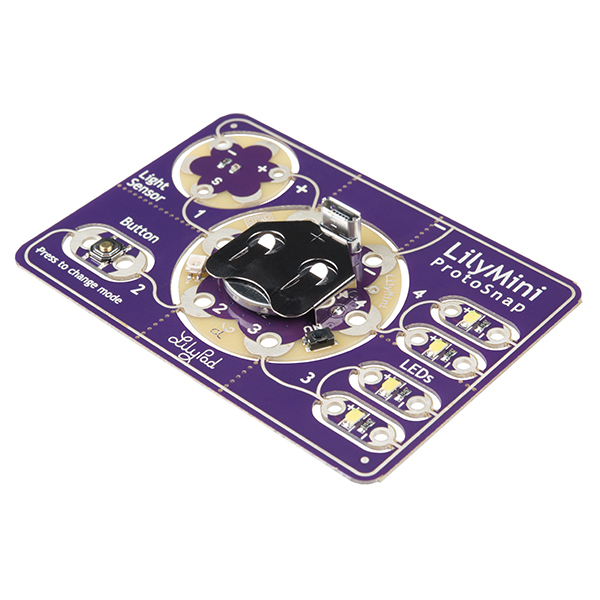 Like other LilyPad ProtoSnap boards, the LilyMini ProtoSnap has all of its pieces wired together out of the box, enabling you to test the circuit’s function before you sew. 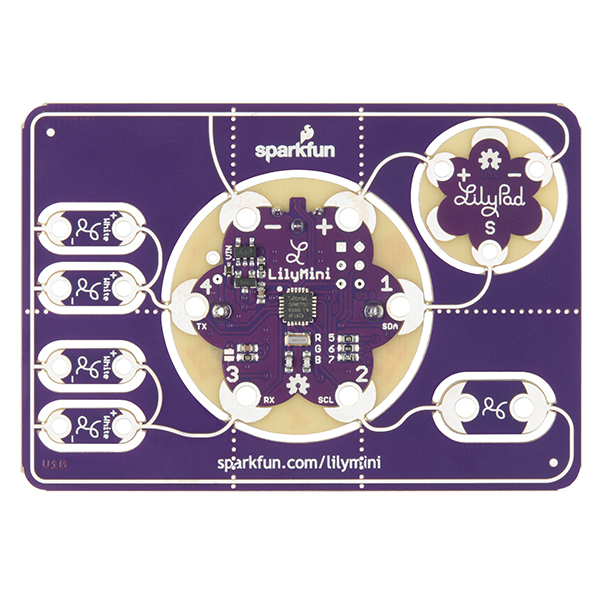 At the center of the board is a pre-programmed LilyMini microcontroller connected to a LilyPad Light Sensor, LilyPad Button and two pairs of LilyPad LEDs. Magenta: LEDs fade in and out in a breathing pattern. When the light sensor is covered, LEDs fade faster. Cyan: LEDs off. When the light sensor is covered, LEDs will twinkle. The LilyMini board, at the center of the ProtoSnap, has a built-in battery holder for a CR2032 battery (included). On the opposite side of the LilyMini you will find the SAMD11 brain, which controls the ProtoSnap. 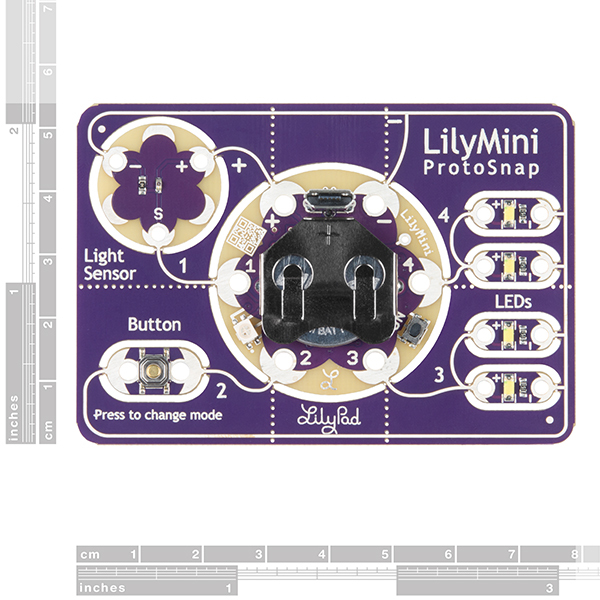 Note: The LilyPad LilyMini ProtoSnap does NOT include sewing needles or conductive thread. These items will need to purchased separately. Can the lights and light sensor of the LilyMini be sewn to something that later on might be washed, without it getting damaged? Both the lights and light sensor can be washed, but be careful. Especially with conductive thread you may want to hand wash, and make sure the garment is completely dry before applying power. I started a thread over in the forum (see forum) asking when the Arduino IDE support might be appearing (was tentatively 1/1/2017 - github). What's the current ETA for Arduino IDE support? If not full Arduino IDE support, how about source code + build instructions for the example it currently ships with? Hi, The description now says, "The board can also be powered through the microUSB port while connected to a computer for reprogramming." Just want to verify that this issue has been resolved before I recommend them for workshops. Thanks! As of October 2017, there are still some bugs in Arduino support for the LilyMini. You can try out the current beta version using our instructions here, but we recommend carefully reading the limitations in that link and evaluating it against your actual curriculum and classroom machines before using it in any classroom setting. As an alternative, you might consider the new LilyPad ProtoSnap Plus which was also designed for classrooms and workshops and has full Arduino support. I'm typing this on Jan. 11, 2017, and they're listed as "in stock". I happened to notice the date on the schematic is 12/14/16. I'm impressed -- I know the complexities of getting a new product out, though the schematic says "REV 10", it still (likely) means a new PC board, and getting the manufacturing lined up. With all the holidays in there, less than a month is pretty good for a $15 product. Credit where credit's due: this board was a complex one for us, and development took longer than we hoped. This usually means that the last stage, production, unfairly shoulders the burden for getting it out on time. But even short-staffed for the holidays and with numerous high-priority builds on their plate, our production team quickly and flawlessly worked it into their flow. They're the best in the business. Given that the other Lilypads have Arduino IDE support, and given that no where in the product description does it say the LiliMini does not, and given that it has a USB port (that's a lot of givens), it is reasonable to assume that you can reprogram this board. You cannot. At least not easily, and only by soldering a connector on for an external programmer. Five months later and still nothing. The blinking LEDs are only entertaining for so long. Sorry to hear about the issues with the Lilypad mini. We're still working on getting the arduino definitions and programming method setup on the new SAMD11 board that's on the Lily mini - it's a little different from the traditional lilypads AVR chip. We hope to have them up as quickly as possible. I apologize for any frustration that working with the board before the Arduino USB programming capabilities are finished. I ordered several of these for our Maker group - It's great for the kids to play with the functions before the incorporate them into a project. It really helps them understand how everything will need to be connected.